About two years ago I featured creative paper projects designed by Jo Neville of Sydney. At the time she didn't have an official website, but I was delighted to discover recently that she does now. Paper Couture is a beauty... you'll see things there that you won't find elsewhere. After rescuing this old chair from the curb and allowing it to languish for a long time in the backyard, Jo turned it into an objet d'art for a collaborative exhibit. 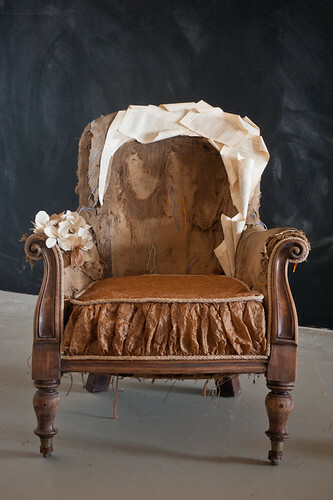 She replaced the worn upholstery with a ruched paper seat, piping, and flowers created from the pages of French novels. Originally a graphic designer, Jo enjoys making everything she can out of paper, specializing in paper installations. Her custom stationery designs are uncluttered and simple - no doubt the exact reasons people find them so appealing. Currently she's working on an installation at Murobond in Artarmon, NSW, which opens March 31 and will be on display throughout April. Jo is transforming the showroom into a flower shop called The Papered Flower - I expect it will be beautiful! One last thing... be sure to check out the latest online issue of Paper Runway. Not only is it full of paper delights as usual, but Jo's stitched paper globe is featured on the cover. Ann, Thanks for showcasing Jo's artworks. Congrats to Jo on her up coming installation at Artarmon, I would love to be able to get over to see her paper flowers!Thanks for the link to Paper Runaway mag too. Such creative elegance. Lovely work. Thanks for the link to her blog Ann, so nice to read the story of this chair. And also loved the card board frames in her blog.